This is my week 3/Row 3 check-in. I decided to make the row that’s under the Tulips in my sketch, which also happens to be this month’s Twinkle block. I need 7 of the 9-inch blocks for my 63-inch row. 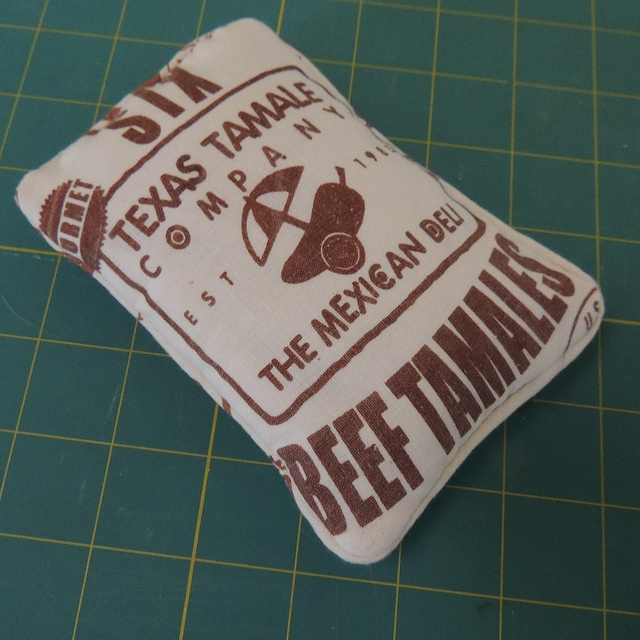 I chose the beef tamale sacks (printed in brown) for this row. I decided to follow the example of my tulip row and use only 4 of the print fabrics–all different than those used for the adjacent tulips–and combine them with the shot cottons. Like with the tulips, I arranged them in value order, with the darkest in the center. Here’s how they look all together, laid out on the floor. If you are thinking all three rows don’t look exactly the same width, you could be right. I’ve decided I will add or chop off when the time comes and not worry about it. 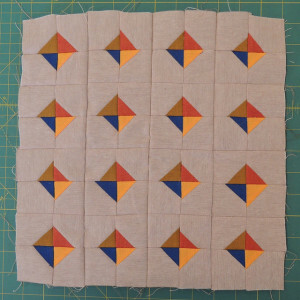 If you have made the block you know that these small–sewn together, they would make a half square triangle unit with a finished size that is smaller than an inch. 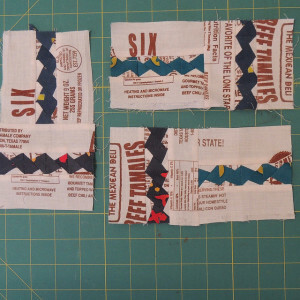 I confess that when I made the lotto blocks for this month, I deemed them TOO small to save and tossed them. But this time I started to wonder what they might become. 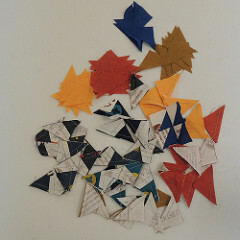 I started with the triangle pairs from the corners. 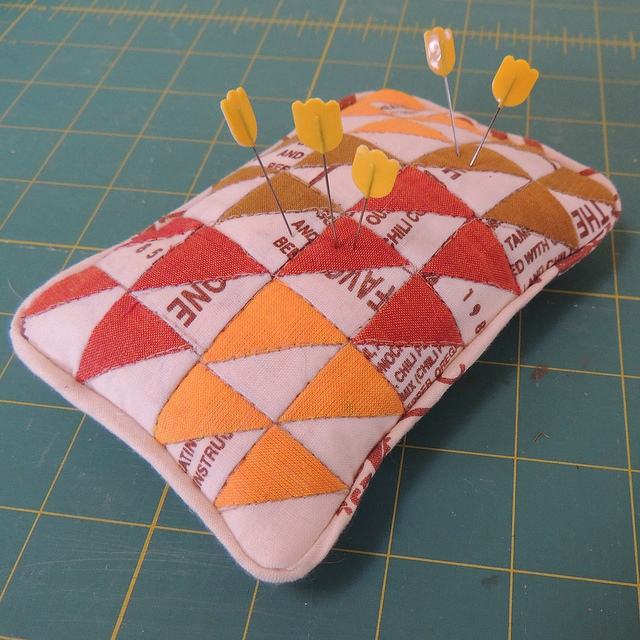 I sewed them together and then sewed the into tiny Little Cedars blocks (made from 4 half-square-triangles. I decided they could become a pincushion. 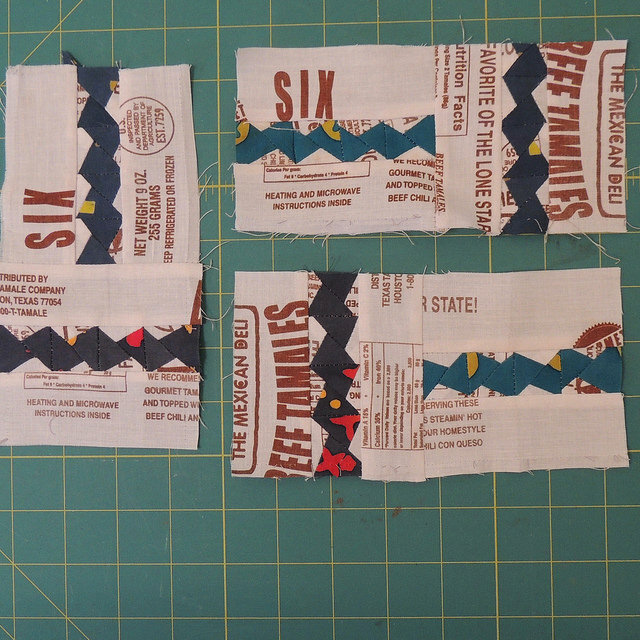 I used a piece from the front of a tamale sack for the back and cut bias from the rest of the sack for the piping. (I couldn’t resist using one of the drawstrings to fill the piping). It’s filled with cotton filling. I thought it was a nice example of how using the little leftover bits from a quilt that you might not be keeping can become a souvenir of that quilt. Next I asked myself one of those “what if?” questions and decided to use a the rest of the shot cotton triangles with a new fabric. 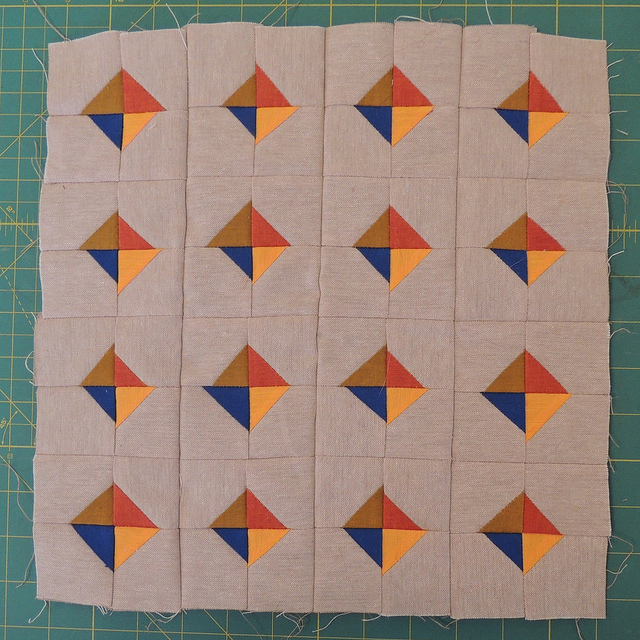 I cut some neutral-colored quilter’s linen into 2 inch squares and added the triangles to the corners. 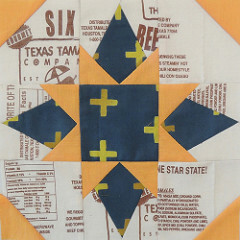 Then I sewed them into 4-patched and then into a 12-inch square. I am happy with the result, but I haven’t yet decided what it will become: mini-quilt, pillow cover or the beginnings of a linen tote. What do you think I ought to do with it? Here’s the before and after. I liked how the small bits of iridescent fabric created a completely different feeling when combined with the linen fabric … and thought these triangles were definitely worth saving. 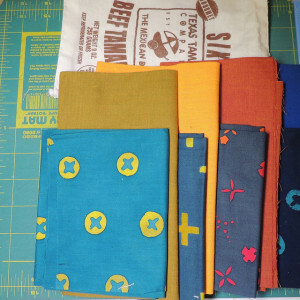 I was left with the triangles that had both tamale sack and printed fabric. I wondered what would happen if I sewed them in strip, so I tried it. The create a cool little zig zag. 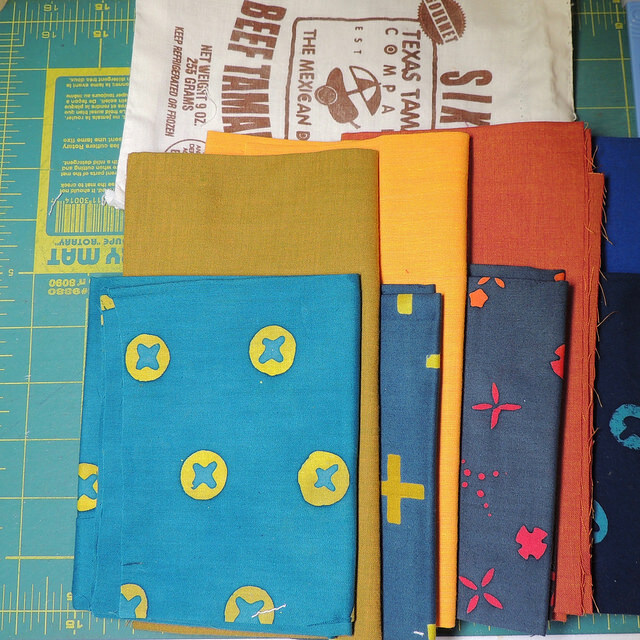 I added more of the tamale sack fabric which unfortunately overwhelmed them. For the moment, I’m leaving them in this state because I know there will be more bits and pieces to be used from future rows. Wow! Really like your “12 weeks 12 rowa” project. 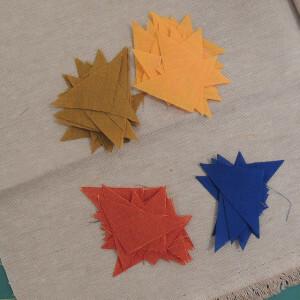 Also liked what you did with the little waste triangles — gave me an idea for using some of my many many many “saveds” that I just couldn’t wrap my mind around as to how to use. Really liking your row by row, Sophie, and those tiny projects are cute. Neat ideas with the leftovers. I have a box of half-square triangle blocks – most tiny like this, that I will have to take another look at. I really like the tamale bag backgrounds – so unique! I really like how your quilt is turning out. I look forward to seeing each post showing your work in progress.. Also like the ideas for the leftovers..